Ban said there are several theories about the origin of the cholera outbreak, which was confirmed by lab tests on October 22. The disease struck about nine months after a devastating earthquake left much of the capital Port-au-Prince in ruins, forcing hundreds of thousands of people into makeshift camps of tarp tents. The waterborne disease has already killed more than 2,400 Haitian people and infected nearly 110,000 others, 55,000 of whom had to be hospitalized. 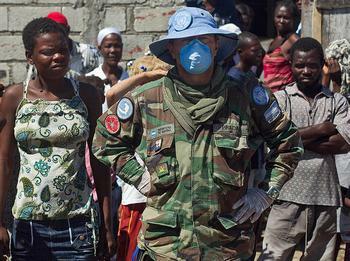 MINUSTAH and the Haitian government have conducted a number of tests to determine where the disease originated, but all so far have been negative. Haiti had been cholera-free for over 50 years. The new UN panel will be completely independent and have full access to all United Nations premises and personnel, Ban stressed, adding that further details will be provided when the panel is finalized. “We want to make the best effort to get to the bottom of this and find answers that the people of Haiti deserve,” he said. The secretary-general appealed for more funds to save lives of cholera victims and prevent more people from getting the disease, which is spread by contaminated food and water. He said it is crucial to get the message “out, far and wide” that the disease can be managed through early treatment and some clear and simple steps, including washing hands with soap. The number of cholera cases continues to grow in Haiti, but a smaller proportion of people who become ill are now dying from the disease, according to the latest data. In the first weeks of the cholera epidemic, which began in late October, the proportion of hospitalized patients dying of cholera was as high as nine percent. 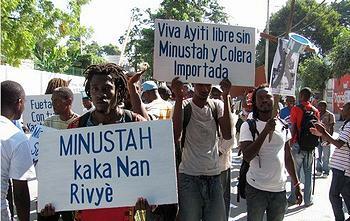 In the latest reports from Haiti’s Ministry of Health, that figure is down to 3.5 percent. Epidemiological modeling carried out by PAHO/WHO and the U.S. Centers for Disease Control and Prevention for planning purposes projects an estimated 400,000 cases over the first 12 months, with as many as half those cases occurring in the first three months of the epidemic. Haiti’s Ministry of Health proposes to increase the number of cholera treatment centers and expand efforts to promote prevention and treatment at the family and community levels through public education and by providing chlorination tablets and oral rehydration salts. This work alone will require an additional 350 doctors, 2,000 nurses, and 2,200 support staff over the next three months, training for some 30,000 community health workers and volunteers, and additional supplies of oral rehydration salts and water purification tablets, said Dr. Andrus. To make things even more difficult, a brief but intense wind storm tore through Port-au-Prince earlier this week, felling trees, and tearing tents apart in the camps for displaced people. On the streets of Port-au-Prince and in the country towns, hopelessness and anger mingle with a new grassroots mobilization for change, according to the independent Haitian media organization Bri Kouri Nouvel Gaye. “Eleven months after the earthquake, so little has changed. Haitians who have been living out in the open are beginning to lose patience, as we saw through the angry protests in the street last week,” says BKNG on its website. “While Haiti is much more than Port-au-Prince, the camps of internally displaced people living in the metropolitan area have become the most painful reminder of the failure of the international humanitarian community and Haitian authorities to decisively provide assistance that changes the conditions of homeless earthquake survivors,” BKNG says. “Haitians never expected to be rescued, and in recent months a new grassroots mobilization for change has begun to grow throughout the IDP camps, the neighborhoods of Port-au-Prince, and the peasant movements of the country as a whole. Through peaceful protests and popular university discussions, people are beginning to envision their own path for the future,” says BKNG. UN Children’s Fund, UNICEF, Executive Director Anthony Lake visited a cholera treatment center in an impoverished area of the capital Port-au-Prince this week, where he pledged continued UN support and pleaded for international support for the children. “As always, and without exception, children are the most adversely impacted by crises such as this cholera epidemic and the January earthquake. The responsibility we all share is to ensure that children and families are protected from these emergencies as well as from the recent political tensions,” Lake said, referring to last month’s disputed presidential and legislative elections. Lake said the current environment of uncertainty and insecurity in Haiti places children and families at even greater physical risk and also inhibits the efforts of humanitarian agencies such as UNICEF. 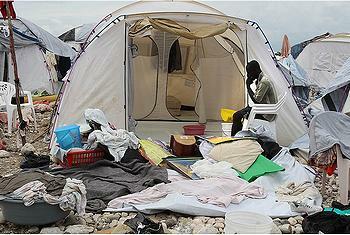 The earthquake destroyed hospitals, water supplies and sewage infrastructure, and left over a million Haitians homeless.